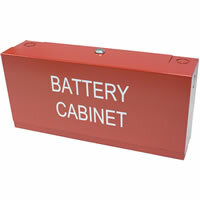 The BCA Battery Cabinet Accessory is designed for the professional installation of systems requiring battery storage. 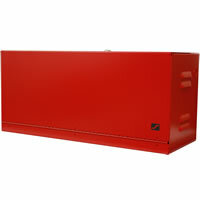 BCA cabinets meet the requirement of NFPA 72 (1-5.2.9) for standby battery storage for battery backup. The BCA allows for easy access and maintenance of the batteries while also assisting against unnecessary power drain, interference or degeneration of the battery. The unit can be mounted securely to a wall, preventing mechanical injury or damage to other equipment. The BCA cabinets are constructed from heavy-duty 16-gauge steel with a full length piano-hinged door to allow optimum access to your equipment within the cabinet. Other features include a high-security CAT 30 keyed door lock and vented sides. Complete interior and exterior finish is accomplished by a phosphate treatment followed by a durable baked-on textured polyester coating. 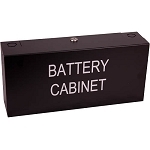 The Space Age Electronics BCA Battery Cabinet meets the requirements of NFPA 72 standby battery storage for battery backup and allow for easy access and maintenance of the batteries. The SSU00501 features a black textured finish and is 22-in W x 10-in H x 8 1/2-in deep.